Cholesterol is a fatty substance that occurs naturally in the body. It performs several vital functions. Our body makes cholesterol we need and we need only a small amount of fat in our diet to make enough cholesterol to stay healthy. The fat and cholesterol we eat are absorbed in the intestine and transported to the liver. The liver converts fat into cholesterol, and releases it into the bloodstream. There are two main types of cholesterol: low-density lipoprotein (LDL) cholesterol (the "bad" cholesterol) and high-density lipoprotein (HDL) cholesterol (the "good" cholesterol). High levels of LDL cholesterol are linked to atherosclerosis, which is the accumulation of cholesterol-rich fatty deposits in arteries. This can cause arteries to narrow and slow down or stop the flow of blood to the heart or brain causing a stroke. To control bad cholesterol (LDL), WHO has recommended the use of indigenous plants as suggested in the traditional system of Indian medicine, instead of main stream medication that has damaging side effects. 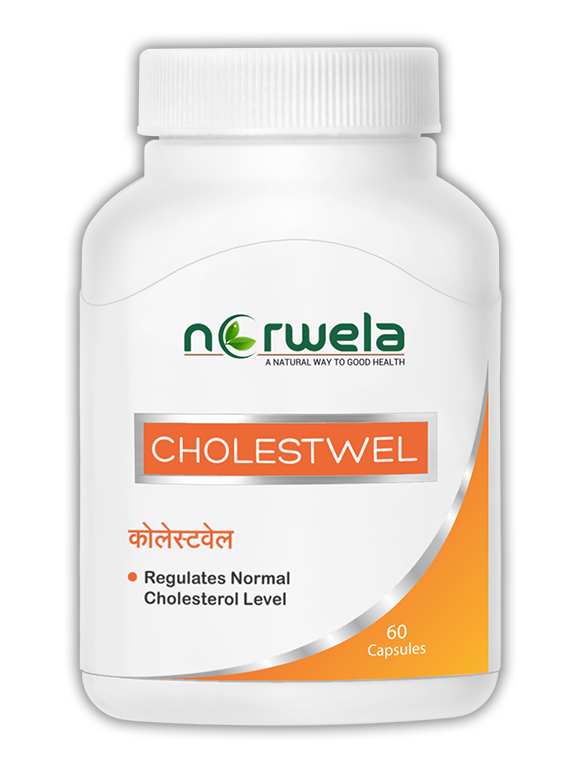 When diet and exercise are insufficient to help you control your cholesterol, Norwela’s CholestWel may provide you with viable and natural support. Norwela’s CholestWel is the most effective blend of powerful phyto-constituents derived from nature to regulate normal cholesterol level. It is clinically proven to reduce total cholesterol, serum triglycerides as well as Low Density Lipoprotein (LDL). CholestWel supports body’s natural metabolism of cholesterol and help maintain a healthy cardiovascular system.